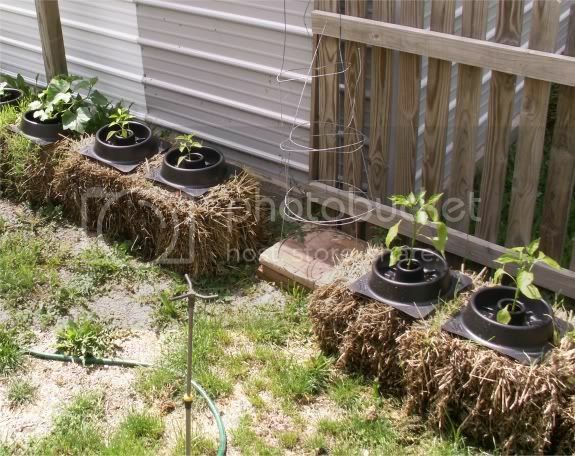 Tomatoville® Gardening Forums Index > We're Here For The Tomatoes!™ > Soilbuilding 101™ > Growing in straw or hay bales? Growing in straw or hay bales? 1. Are we talking straw or hay? 2. How do you dig out the hole for the plant? 3. Do you put any additional soil in the hole? 5. How often to fertilize? With what? 6. Do you let them sprawl or do you stake them or something? They're several good articles to be found using a google search. Here is the one I was going to follow. a terrific thread and this answered a lot of questions in my feeble mind. i am going to do nothing but raised beds. this is great. add some compost in the beds. cardboard on the bottom. keep adding all or any organic materials. compost tea and home made fish emulsion. i knew this would finally happen. this has been a personal quest for over 30 yrs. Tim, Thanks for the link. I did a search on T'ville but not on the web. After reading your post I did a search of the web and there are indeed a lot of links. Most of them seem to say the same information as your link provided. I'd love to hear from a few folks here with personal experiences to share. Demblu, are you still around? Any others tried this? I'm conditioning a bail now, it'll be fun to see what happens. Nothing to lose but an extra bale and a couple of plants that would have ended up in the compost bin! but i hope you can see this pics here. Wait....i'm new...and cant get a pic to load, could someone please help? i cut the bale with a bread knife, the size of the little plants feet, no soil added, water when they start to droop, but normally i water each day, i fed them once with zoom. this year we are trying the tomato boosters for most of our plants. last year i just stuck them in the hay. Your problem comes from using hay instead of straw. I finally was able to lock in my brain which of the two you should use in the garden with the phrase "Hay is for horses". Straw is what you want for gardening because it does not have all of the seeds/weed problems. Thanks for the detailed "how-to link. 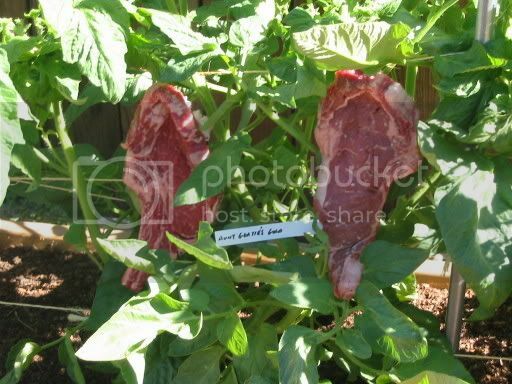 That's what I call a truly rare beefsteak tomato plant. T.- Those must have set you back a pretty penny--hoped the neighbors did not see you set up that shot or any possibility that they would ever view you as "normal" seems unlikely. Back to growing in straw bales: There is a long thread on Dave's Garden under Vegetables if anyone is a member and cares to look. I also find this method very interesting and am giving it a whirl. On the other site there are people having problems but it does work-- even an old book I have mentions the possibility of herbicide tainted bales so if problems persists maybe that is the culprit. The book I have is published in Great Britain in 1967 entitled "Tomatoes for Everyone-Including Ring Culture and Growing on Straw Bales". It was written by Frank Allerton. 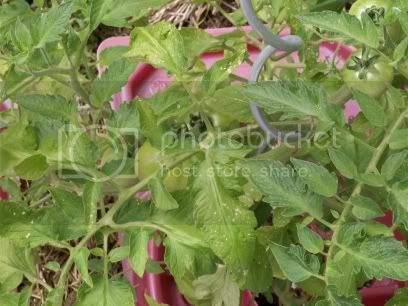 It shows 2 pictures of tomatoes growing in straw bales in a commercial greenhouse and the plant is LOADED with tomatoes. One of the additional benefits he mentions is that in a greenhouse as the straw breaks down carbon dioxide gas is given off and that also benefits the plants. Here is how he prepares the bales. Water for 10 to 12 days with 1 gallon of water. Cover with plastic to prevent loss by evaporation in sunny weather. (Ignore mold, not harmful.) He also has them sitting on a two inch deep trough of plastic but this is in a green house, not necessary outside. Now this is where you have to improvise with products available nowadays or just follow tried and true methods outlined on the internet. Spread 1 lb. nitrochalk, 1 lb. superphosphate, 1 lb. nitrate of potash, 4 oz. epsom salts, and 3 oz. sulphate of iron on top of bale. Water in with 1 gallon of water. Repeat in 1/2 hour with another gallon of water. Cover for a few days keeping bales moist by sprinkling with water. Before planting make sure the composting process has cooled down as too much heat could hurt transplants. He then puts 2 bottomless shallow container on top and fills with soilless mix and plants BUT THE COMMERCIAL PICTURES IN THE BOOK just show the plants right in the straw where I presume just enough potting mix has been added to plant in. 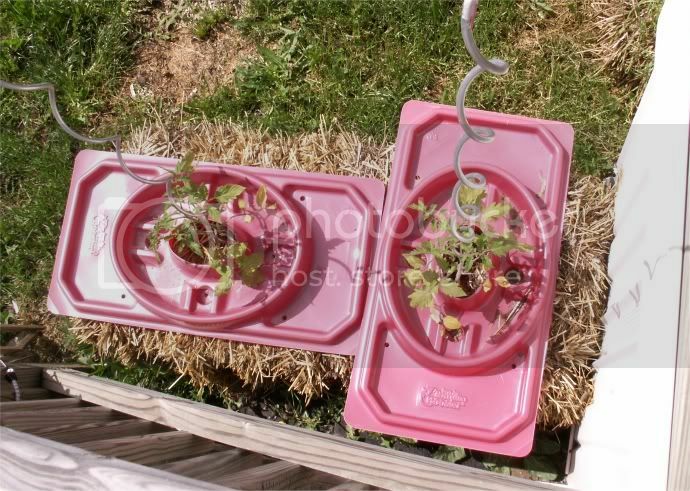 (I believe the containers are used so the plants are not going into coldish straw and will produce earlier.) If growing outside skip the containers as they dry out too quickly though he does say you can encircle the bales with plastic if this a problem. He recommends starting to feed 2 weeks later. (1/4 # nitrochalk every 2 weeks for a total of 3 or 4 times) ALTERNATE with liquid feeding (use a high potash tomato liquid fertilizer). The interesting thing is he says that almost as spectacular results can be achieved by using 'straw wads' of 6 to 8 inches rather than the whole bale. Unfortunately, as mentioned above weedkillers can be a problem in some bales. Bummer. This is really fascinating! I have to give this a try. I wonder if there are any downsides to using this method in my very hot climate. ?? ?